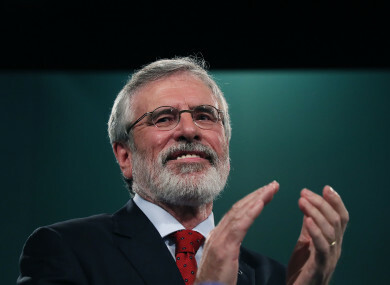 SINN FÉIN PRESIDENT Gerry Adams has ruled himself out of running for the Irish presidency. The republican leader, who yesterday announced he will step down as leader of Sinn Féín next year, ruled out putting himself up for any election – be they for the Dáíl, Stormont or for Uachtarán na hÉireann. Asked on RTÉ’s This Week if he would follow in the footsteps of his late colleague Martin McGuinness and run for the Áras, Adams responded with an unequivocal “no”. Adams also spoke of his disdain for how the Dáíl works. The TD, who topped the poll in the Louth constituency in the last election, said that the Irish parliament “has all of the worst aspects of the old British system”. In his address to the Sinn Féin Ard Fheis last night, Adams said that the time had come for him to pass the baton to the new generation of Sinn Féin politicians. Comments have been disabled due to the high number of flagged comments. Email “Gerry Adams will not stand for Irish presidency”. Feedback on “Gerry Adams will not stand for Irish presidency”.